I was looking through the internet for news of A Richard Borthwick who may have been an actor or a cartoonist, and was wondering if this is the person? Hi Rodger, I haven't been on this site for ages and have just noticed your comment from long past, but it can't be the same Richard Borthwick - my uncle's talents were in music and sport rather than acting and art. Location I think is in front of the Cromlet school. The flagpole is behind Frankie Hoy and the Bank House and oil tank are in the background. I think you are right Willie, the old infant's school up the school brae. Just come across this photo. l seem to remember this building was used for art, gardening, and woodwork about 1949.....1950. Nigel, the art class was on the second floor, the rest of the rooms were for the primary classes while I was in the academy. That's correct, I think the wood work shop was to the rear. Woodwork was at the rear like Nigel says then it moved down past the canteen. Also gardening was done here. I remember us all given shovels and in a line turned the soil, but don't remember planting anything. I remember being in Miss Crystal's P1 class and seeing Kenneth Boyd go past dressed in a Top Hat covered with a net going to see to the bee hives round the back of the main Cromlet building. Wonder if he got a short straw or whether it was a sought after job. The gardening was done in the plot between the school and Rod Macgregors house. Mr Rose the Jannie used to grow veg there too. 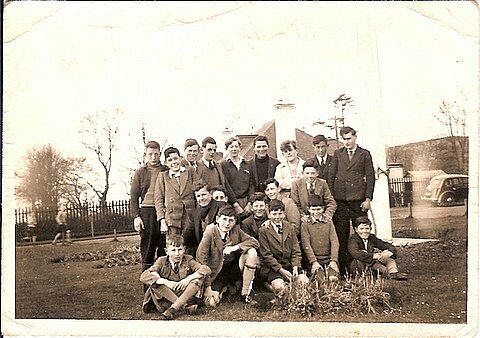 Does anyone remember the army cadets who went to Troon about 1948? I went but cannot remember anyone. I was in the cadets for a time but I don't remember who went to Troon. We felt very grown up as 12 year olds, when at half time the instructor said " Right men, fall out for a smoke". The main attraction was setting up and stripping down the Bren gun and firing the .22 rifles. I remember Jimmy Connel wandering down the range and being shot through the calf. His response was to shout "***** I've been plugged!" He recovered quickly. Thanks for the information Gordon, I don't remember much about the cadets, but I do remember taking photos on a box camera and taking the spool for development at your father's shop. l also remember the names of the top row in the photo L to R Richard McCrae Gordon Fraser Doshy Benson Allan Campbell Swanson Ian Dingwall Myself Ken McPherson Frankie Hoy. A few names come to mind, although most of the faces are familiar. In the second row from l to r, Edward Benson, possibly Alan Crombie from Saltburn (forehead only showing). Front row: Ronald Thom, who came from Aberdeenshire, next, name unknown, Korky MacDonald, possibly Norman MacDonald (Norrie Ned), Edward Millar (Wardie). This is a mixture of two year groups, with Eddie Benson, Iain Dingwall and Ken MacPherson being in the year above me, with the others in my year. I may be wrong but I seem to remember that the woodwork classes were composite, made up of two year groups under Bill Smith, as were the Gardening classes, under Mr MacDonald. This perhaps explains why the two year groups were there. Another memory was of an event in Miss Nicol's singing class, in which we were invited to do a little musical turn, either solo or in ensemble. I did a duet with John Cunningham in which we sang the old Scout song, "You'll never go to Heaven". John was a gifted scholar but less so as a singer. Nigel treated us all to a piano and vocal rendition of a popular number of the time, "Balling the Jack", along with cheerful actions. Miss Nicol was a delightful lady and gave us a good grounding in singing and I am sure engendered a love of music in many of her pupils. Looking back on our school days at Invergordon, and considering the the difficulties and restrictions the staff were working under, those who chose to take advantage of what was on offer, were well served by the majority of the teachers there. Thanks Gordon for refreshing my memory especially the music lessons. What a memory you've got!! I went on to become a musical entertainer in the south of England. As you say John Cunningham was an outstanding scholar who I competed with but in academic subjects he was always top boy. John Auchterlonie was also a challenge, but when it came to sport, lan Dingwall, Billie McPherson and myself were unbeatable. lnvergordon Academy will always be in my heart. Dickie Borthwick plays for a new club.